5005249 Iconic Easter 2018 is now available in Sainsbury's stores across the UK. The set is free with LEGO purchases of over £20 but can also be bought individually for £4.00. Thanks to Brickulator 93 and ScotlandKerr for informing us. Looks like a trip to my local Sainsbury's tomorrow then.... even though I hate the place. lol. 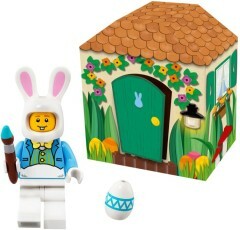 Whenever I see Lego's Easter sets I wonder, how many people actually paint the eggs? Using a vinegar-dye coloring seems to be the popular method of coloring eggs here. Painting seems a bit more old fashioned; but I imagine with a talented artist it probably looks 10x cooler! I regularly shop at Sainsbury's so I, ll happily pay £4 for this, I like the new Azure blue tipped paint brush, and that egg element is cute too.. Available in Germany in many toy stores for 2.99 Euro. Got two for the kids' Easter baskets. Just got one. They had quite a few but not as many as the Chicken suit guy where they had hundreds. This set is cheaper in Europe than the USA? Not fair. Maybe they will have these on clearance at TRU. @David1985 My heart bleeds for you. @David1985: how much is this set in the US? Well the chicken suit guy was $6. We don't have a price yet from TRU (If they ever sell it at all, it's just a free giveaway thing.) but Lego [email protected] has it in fine print being worth $6.99. Doubt Toy R Us will get these given they're all shutting within 6 weeks now as they've not gotten a buyer. GrizBe, they would have already have gotten them in stock at least a month ago. They either get the promos really early or really late but because this is a kids building event they should have gotten them super early. I purchased over £20's worth of Lego in Sainsbury's today 16.3.18, the advertising clearly stated the offer of a free rabbit for £20 spent on Lego. @David1985: Going off my local Smyths store, I know they never get their promo stuff until the week of the event. As said, given TRU troubles which have been known for a while they're gonna all close down, doubt they'll have got them at all. I still think they probably got them because the event was still scheduled until the bankruptcy was announced. But they might have to send them back to LEGO because of the bankruptcy. I should check to see. LEGO will now have an overstock of these, probably have Target give them away for the next few years like they are with the chicken suit box. Best part is the TRU CEOs and people up top get 14 million dollars from the bankruptcy court. The 30,000 who did all the work and didn't get the company to close get nothing. Nothing in the Sainsbury's near me.